MBnano-10 е микропроцесорен двупосочен M-bus към USB конвертор. MBnano се захранва от USB порт на компютър/laptop и може да захрани максимум 10 подчинени m-bus устройства. Предназначен е предимно за използване от инсталатори и инженери 'на терен', но е подходящ за всички, които се интересуват от m-bus интерфейс. Конверторът е прозрачен, което означава, че ще работи с всякакъв софтуер, стига да са инсталирани правилно USB драйверите. MBnano-10 USB е защитен от късо съединение в изхода. For about 0.2-0.3 s the device is busy with initialization of important parameters. During initialization the output is forbidden and the output voltage is 0 V. Output becomes active, the unit then measures current consumption of the connected slaves. Led ‘OUT' (allowed output/transmit) become active. If short circuit, the output is held forbidden and after a few second a new check is done, while led ‘OUT’ are turned off. Continuously the unit measures current consumption of the connected slaves. If the consumed current becomes higher than 35 mA, the led 'OUT' becomes red. If the consumed current becomes higher than 45mA, the output is forbidden and turned off. MBnano-10 is a dedicated bridge for the connection between computer and slave m-bus devices. The data is transmitted immediately, without delay. When a slave device is sending information, this data is first decoded according to RS-232 protocol and then send via USB serial port, with no delay. It is possible simultaneously to transmit/receive data. If collision (two or more slave devices send instantly) data is still transmitted via the USB interface. To save power, if more than 20 minutes device stays idle - power is shut down to save USB consumption. On first received telegram MBnano-10 will wake up, but first telegram will be lost sue to initialization time. This smart function can be turned off with manufacturer specific command from USB port. This devices is generally intended for engineers, who in some cases need to easy set-up m-bus devices, which are already installed. 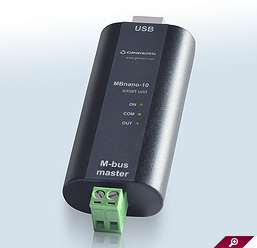 Each MBnano-10 comes with 1m USB cable A-to-B. USB drivers needed are FTDI drivers and can be downloaded freely. Any m-bus software can be used with our MBnano-10. МBnano-10 е hand-held устройство за свързване предимно към laptop/notebook. M-bus изходът се свързва на разглобяема дву-полюсна клема (поляритетът няма значение).